Its happened again, Folks. Every week Tuesday rolls around. Always right after that dreaded Monday and a day before Hump Day ( I still giggle every time I say Hump Day)…but I digress. The trails await! I see them in your future! And I don’t even know how to use a crystal ball! Nor did I stay at a HolidayInn Express last night (see how many get that reference!). I don’t need no stinkin’ gypsy telling me that there are trails in… my future, I already know that! There are trails in your future too! Sounds like there is a chance of precip today but the mud is already there from last week. Enjoy it! Afterwards we will head to the Outta the Way to address our self-induced our blood glucose and muscle glycogen depletion. Thats a fancy term for stuffing beer and burgers down our pie-holes. Sound like a plan? Good, then, I’ll see you at the Lake! Course: We will run around the lake clockwise doing Parilla Path and out’n’back on Troll Trail, then hill repeats on Potty Hill. * Got Summer running plans? Well, we kicked off the Summer 25K Training last Saturday. I’m getting the schedule posted today Its low-key and cheap but awesome! Target race is the MD HEAT 25/50k on August 18th. Join us on Saturdays even if you are not training for anything. Just come run trails! 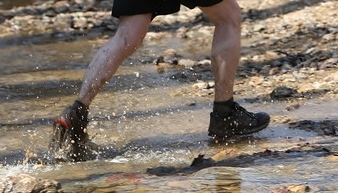 Next Post Muddy Shoes Summer Training Schedule is here! !